Left: Tan Sri Md Nor & Tan Sri Abdul Aziz Zainal. Pictures taken from NST. Jaringan Melayu Malaysia (JMM) has called for Tan Sri Abdul Aziz Zainal, the former Malaysian ambassador to France and General of Malaysian Arm Forces, to take over the chairmanship of MAS from Tan Sri Md Nor Md Yusof. JMM is confident that Tan Sri Abdul Aziz would be able to bring MAS back to its former glory, in HERE. Tan Sri Md Nor Yusof was the Managing Director of MAS from 14-2-2001 to 31-3-2004. When he was the MD of MAS, he appointed BinaFikir Sdn Bhd to restructure MAS. BinaFikir Sdn Bhd’s logo. In 2008 It was sold to Maybank for RM8 million. BinaFikir Sdn Bhd was co-founded by Tan Sri Azman Mokhtar and En Mohamad Rashdan Yusuf aka Danny, who had to leave MAS in disgrace. Please read HERE (strangely the links to Binafikir’s website in the posting have disappeared & it shows “under constructions”), HERE, HERE, HERE. Tan Sri Azman Mokhtar is the MD of Khazanah. Rumour has it that after En Mohamad Rashdan Yusuf aka Danny left MAS he was absolved into Khazanah. Although the contents of BinaFikir Sdn Bhd’s website have disappeared or “under constructions” (do not for how long), you can still see it HERE. BinaFikir was appointed to save MAS. It came out with WAU (“Widespread Assets Un-Bundling”). In short, WAU’s main objective was to make MAS an “Asset Light Airline”, HERE. Prior to “WAU” MAS has assets worth RM5 billion and liabilities too. After WAU, MAS got lighter and lighter so it flies higher and higher! Tan Sri Md Nor Yusof was also responsible for disposing off 70% of MAS Catering Sdn Bhd to a company owned by Datuk Ibrahim Badawi, who is the brother of Tun Abdullah Badawi. Immediately thereafter he saw it fit to sign the 25 years one sided catering contract. What a clever decision for the MD of MAS to make at the material time! Please read HERE. Under this one sided catering contract, MAS had to commit RM6.25 billion for 25 years for all its foods and other related services with LSG Skychef Brahim’s Sdn Bhd. MAS has little or no power to negotiate on prices charged for good and services. Hence, a stick of stay cost RM3.20! How about the price of mineral water, juices, eggs, beverages and other foods? Could MAS staffs help us with the prices of food and beverages that MAS had to pay to LSG Skychef Brahim’s Sdn Bhd. No other airline in the world had signed a one sided catering contract for 25 years except MAS when Tan Sri Md Nor Yusof was its MD. 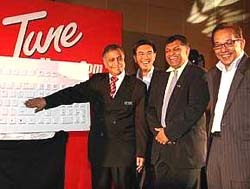 Left: Tan Sri Nor Mahamad Yakop, the then extremely powerful Minister of Finance II, was officiating a function of Tune Money Sdn Bhd, an AirAsia related company. By the way when the 25 years catering contract was signed, Tan Sri Nor Mohamad Yakop was the extremely powerful Minister of Finance II. Of course, Tan Sri Nor Mohamad Yakop was not aware of such a one sided contract that had burdened MAS for the past 11 years and another 14 more years more to go! If at that material time, Tan Sri Nor Mohamad Yakop were to know about this unfair catering contract he would have stopped it. Therefore, we cannot blame Tan Sri Nor Mohamad Yakop for it as he was totally unaware of such a huge contract signed by MAS then. Now that he has been recently appointed as the Deputy Chairman of Khazanah, we hope that he should now know about this one sided catering contract and do justice for not only MAS but the nation, as MAS is our national airline. The “Happy Family”. Left; Datuk Kamarudin Meranun, Tan Sri Azman Mokhtar, Tan Sri Md Nor Yusof, Tan Sri Tony Fernandes, En Mohamad Rashdan Yusuf aka Danny and Datuk Nazir Razak, the CEO of CIMBThey were so happy after the signing of the MAS-AirAsia share swap. 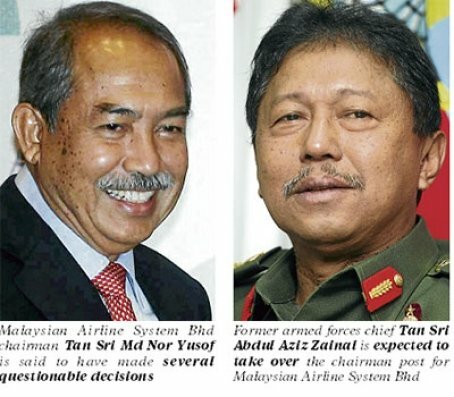 When Tan Sri Md Nor Yusof took over as the Chairman of MAS in August 2011 (a week or so before the infamous “MAS-AirAsia share swap”), many thought that this Tan Sri of good repute and conscience would have at least re-negotiate on the unfair terms of the catering contract to minimise the financial burden of MAS. Two years have passed by and many in MAS were disappointed as this Tan Sri of very good repute did not bother to lift a finger to lessen the yearly financial burden of MAS as far as the one sided catering contract is concerned. Actually it was most unreasonable to expect Tan Sri Md Nor Yusuf to re-visit the one sided 25 years contract for the simple reason that he was the person responsible for signing it. At that material time, he must have thought that signing a one side catering contract for 25 years was the most brilliant thing he had ever done in his life time and, of course, to protect the best interest of MAS. To disgress a little here, Tan Sri Md Nor Yusof has a chequered career in CIMB, GLCs and other government post. After Tan Sri Md Nor Yusuf left MAS on 31-3-2004 he was appointed as the Chairman of the Security Commission (SC) by Tun Abdullah Badawi, the former PM. After he retired as Chairman of SC in 2006, Tun Abdullah Badawi appointed him as a director of Khazanah, HERE. By co-incidence, the present advisor of MAS is, of course, Tun Abdullah Badawi. If Tun Abdullah were to be kept fully briefed of the one sided contract that have burdened MAS, he would not have condoned it. Tan Sri Md Nor Yusof’s term as the Chairman of MAS is coming to an end, it is hoped that those “aviation experts” in Khazanah including Tan Sri Nor Mohamad Yakop, the newly appointed Deputy Chairman of Khazanah, will not be involved in the re-appointment process of Tan Sri Md Nor Yusuf or the appointment of the new chairman. Those “aviaition experts” in Khazanah were too deeply involved in the “MAS-AirAsia share swap” in August 2011. It was also around this period that Tan Sri Md Nor was appointed the Chairman of MAS. By the way, the tenure of En Ahmad Jauhari Yahya aka AJ as the CEO of MAS is also expiring soon. If there is no other yardstick for the Government to go by with regards to the appointment of the top officers of MAS, please look at MAS current share price of about 30 Sen, which is at an all time LOW! The top managers in MAS can churn out as many Business Plans as they like. As long as the share price of MAS hoovering around the miserable 30 Sen per share speaks volume. Need we say more? The Government must now realize that MAS does not need dead wood but real aviaiton experts in order to bring it back to its former glory. MAS badly needs a real TRANSFORMATION and not New Business Plans after New Business Plans without continuity. In September 1996, MAS share price was RM6.60 in HERE! MAS need to run as a business entity and not a Goverment agency. A group of professional must be made to run MAS and not any government servant top post or any political figures , if we want to see MAS to stay afloat for another few years. Yes, it is time for Khazanah to put all sentiments aside and place the right team of professional to fix MAS. company’s direction and strategy” of running a COMMERCIAL airline. One such person who can fit the bill is Tan Si Abdul Aziz Abdul Rahman, former MAS MD. As a practising lawyer to this day, his mind, his brain are very sharp coupled with enthusiastic and energetic personality. What have TS Md Nor, AJ and the Slumberjack advisor done for MAS? Just drawing good salaries and perks. They were making flip flopping decisions after decisions. Terminated flights to Dubai, stopping the growth of Firefly and handing over MAS route to Sydney to AirAsia X. Just a bunch of idiots. What Business Plans? Business Plans to stop Dubai and then reinstate a year later? Business plans to stifle Firefly and then to expand later? Business Plans to give away Sydney route to AirAsia X? TS Md Nor why are you still keeping silence on the catering contract of 25 years that you have single handed signed? Yet you dare to sit as a chairman as though all is well. Now you are hoping that you will be extended. Tak tau malukah?? The shameless chairman who is hoping to get his term extended. Extended so that he could sign another 25 years agreement for something elder. I don’t believe that that mamak Nor Yakop not aware of the catering contract. He may be one of them to get it signed. Any Aziz but not Tan Sri Aziz. Dah tua dan zaman dia tak banyak competition. Sekarang mainan nya lain dan banyak airlines competing. Nostalgia is not a strategy. Md Nor, after what you have done to MAS especially on the catering contract, yu still dare to seek re-appointment to be chairman of MAS? Touch your heart and be honest to yourself. That’s is all we ask of you. Tan Sri Md Nor and AJ are just good at witch hunting instead of putting right their mistakes. They spent too much energies in trying to spy on MAS staffs to cover up their own incompetent. My blood boils when i see an MAS advert promoting Dubai route. A year ago AJ terminated this route on the pretext of losing money and a year later it is reinstated. This shows that Dubai route is a money making route. It was done to please his boss Tony. Not to mention how he circumvented all policies and rules to ferry 50,000 AirAsia X passengers when AirAsia X terminated its loss making routes to London, Paris, Mumbai and Delhi. AJ was responsible for handing over the Sydney route to AAX. Md Nor did nothing to stop this stupid decisions. Yet they are hoping to be re-appointed with hundred of thousand RM and perks. PM must not re-appoint them for the well being of MAS. We cannot have people who are trying to help a competitor. Public funds. Does MAS have a sovereign claim on the public purse? What about the survival of the fittest? That means crap in your view of the universe? 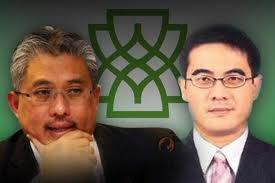 The two top guys in MAS are failed managers. Two years are more than enough. It is better for them to join AirAisa which they have helped so much. It was only now that MAS is showing it is fighting for market shares, which is too little too late. If I were them I will just pack up an join AirAsia, which is growing bigger according to Tony Fernandes. Now here’s Idris Jala opining aloud that MAS should be sold lock, stock and barrel to a private investor and that the government should get out of the airline business. Interestingly, some analysts support this in principle, but say that the timing isn’t right. At it’s current share price, MAS is worth around RM5.2 billion. That’s a hefty investment for any party, especially if full management control and an unrestricted right to hire and fire is demanded. Will the MAS employees union agree to an outright privatisation of the airline, especially if swingeing job cuts are envisaged? The government is caught between a rock and a hard place. It cannot go on pumping funds into MAS with repeated bailouts and restructurings. It’s finances are constrained as it is, and the ratings agencies are watching the government’s financial numbers closely. On the other hand, the government has to content with a vociferous nationalist movement who would view any privatisation and sale of MAS as a betrayal of the government’s socio-economic objectives. This being Malaysia, that could be easily conflated into an issue with racial implications. Also, Singapore Airlines (SIA) seems to be doing ok, with Temasek Holdings as it’s majority shareholder. But even SIA is facing tough, if not cut throat, competition from low-cost carriers and Middle Eastern airlines. Well now Rome, lax, s.africa and Argentinas has all gone. The best thing to do now is to get a law to punished punished and punished all these son of biatch!!! They should be ripped of from their wealth and return them back to the people!!! I’m sure the King and Sultans do not like to see their people being killed slowly by these biatch. So King/Sultan must be given the power to thrown them off, take away their Tan/Tun/Dato and whatever title they have and most importantly PUT THEM ON A PUBLIC TRIAL!!! WHO THE HELL THESE BIATCH THINK THEY ARE??? If criminals are being put behind bars for petty theft and small mistakes WHY CANT THESE BIATCH BE THROWN THERE TOO??? In fact they should be thrown straight to the Sharks!!! Why the double standard? Why the people have to suffer all the time??? Why must the people be the one who have to keep on paying for their act of ROBBERY/TRAITOR by paying extra tax everywhere when these BIATCH live luxuriously on top?? ?